On the 26th, along with our friends T-araDotCom, T-araChina, T-araHK and T-ara6Japan with some leftover funds from our food support, we sent massive bouquets to the girls plus some sweet Starbucks drinks in commemoration of their last fan sign event for their So Crazy comeback. The gesture must’ve certainly pleased the girls as they all took to their Instagrams to show off the beautiful pink and red roses. Thank you to you guys, our amazing donors, for helping putting a smile on the girls’ faces and touching their hearts. this is so sweet. 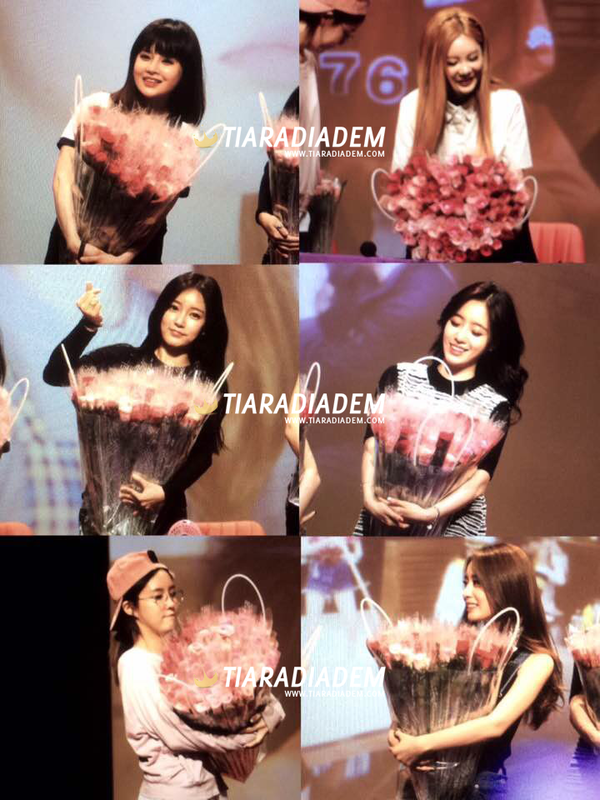 thanks diadem and t-aradotcom prepare the surprise to members. yesterday I just write in members’ instagram to thanks who send the bouquets to 6-ara, never knew that I also has a little credit in it. whoever come this idea, must give them zzang and daebak for the excellent idea. thanks diadem and t-aradotcom ! our eonni looks so adorable with banquet !